No one is more distraught than Augusta, and Sassy wants to help any way she can. But Augusta doesn’t have time for sympathy. She wants Delia’s killer found—and she’s not taking no for an answer. Now Sassy is on the case, and she’d better act fast before there’s any more trouble in paradise. Includes a buttermilk pie recipe! 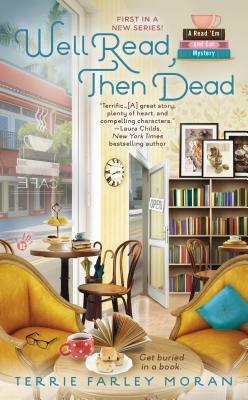 Short-listed twice for The Best American Mystery Stories, Terrie Farley Moran is delighted to introduce mystery fans to the Read ’Em and Eat café and bookstore, where murder and sweet tea are always on the menu. The only thing Terrie enjoys more than wrangling mystery plots into submission is playing games and reading stories with any or all of her grandchildren.